There is no place quite like Newquay in Cornwall. 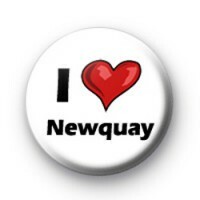 This 1 inch I Love (heart) Newquay badge is perfect if you love this Surf Capital of Britain or have visited with family and friends on holiday and fell in love with its fun atmosphere and beautiful beaches. It really has got it all Sun, sea, sand and surf, how could you not love Newquay and everything it has to offer.